Excellent! I love them. Nice addition and the knives are sharp. Sharpness is always in reach with Henckels International Self-Sharpening Definition Knife Blocks. The self-sharpening slots boast built-in ceramic honing wheels that automatically sharpen when knives are stored or removed. The remaining slots are for serrated knives, whose toothed blades never need sharpening. Tailor-made for J.A. Henckels International Definition knives, these blocks help you maintain the superior sharpness of their fine edge, precision-honed blades. With a seamless transition from blade to handle, the knives' single-piece, precision-stamped blade construction provides durability, while their traditional triple-rivet handle encourages tireless cutting. I am in love with my new knifes so far.. 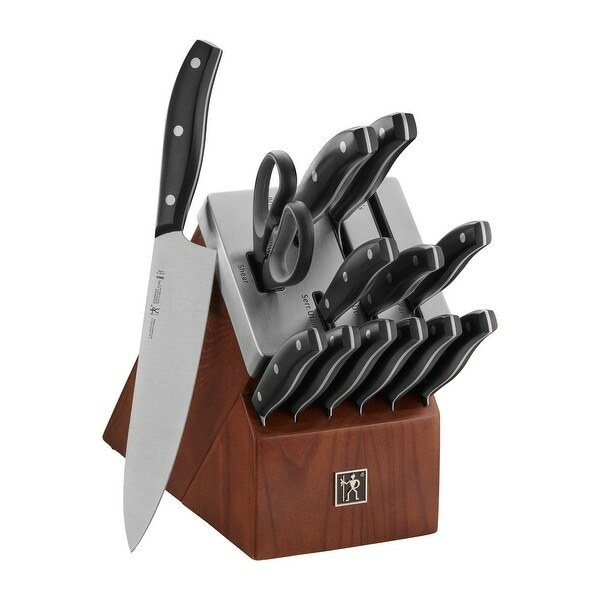 I have have no problem with them being sharp every time I have used them the only complaint I have is the knife block itself is so long but other than that I LOVE THEM!!!!! Self sharpening? I'm excited to see how that works. I've owned Henckles knives before and have always liked their quality. However, all knives get dull, and the self sharpening feature of the block is brilliant! Product arrived promptly. Nice quality. Well balanced. Self sharpening feature makes life easier. Helped make holiday prep a breeze. Would recommend to anyone looking for a knife set. Very nice quality knives at a great price. Arrived quickly and superbly packed. Beautiful display. Knives feel good in hand. Great weight. And clean easily. Very sharp and love the self sharpening block. Definitely recommend. Heavier weight feels good as veggies are sliced and diced with ease. The wooden block with the self-sharpening feature is a dream come true for keeping the knives in tip-top condition and always ready for use. Beauty and function, what more could a home Chef ask? Love them! Great solid knifes, very sharp and clean perfect set for those who do a lot of food prep at home. I would highly recommend this set. I purchased these for a Christmas present. They look like they will be perfect. I received them in a timely manner and they were packaged well. I would recommend them. I have a set of the same brand and they are good knives.